West Pullman was established in 1894. The building’s auditorium has two historic Works Progress Administration murals painted by the artist Ralph Christian Henricksen. 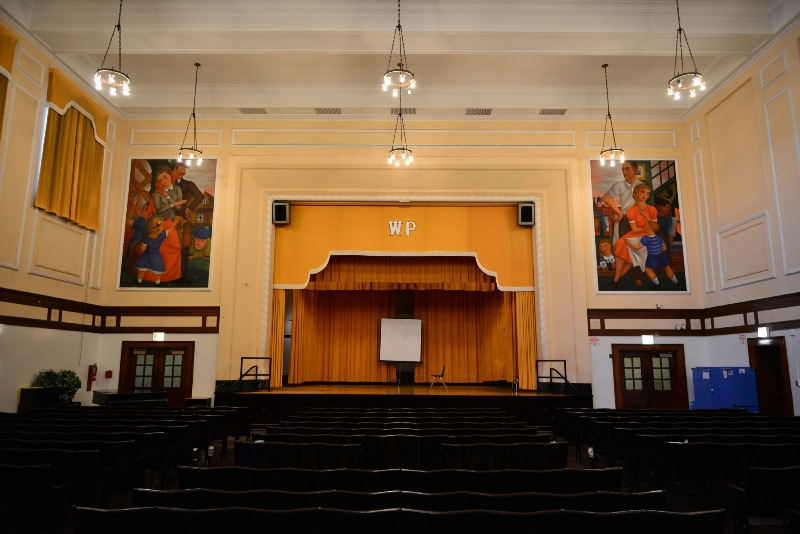 The mural was restored as part of the Chicago Public Schools mural restoration project. In a community area in the bottom third of Chicago’s 77 community areas in terms of percent poverty and percent unemployment, West Pullman provides many vital community resources to its students and the surrounding neighborhood. The school is a new Boys and Girls Club school-based site, and, in particular, a 21st Century site, which is funded in part by a grant from the State of Illinois which covers a paid staff professional for the next five years. The Boys and Girls Club program only started in January and a month later was serving 25% of the student population. At West Pullman, the BGC is not only “a safe haven for our kids every day from the violence out in the streets but academic enrichment, life skills, drugs and gang violence,” in addition to sports and fitness programs and a partnership food program with the school, “so that our kids are not walking home hungry,” according to Paul Lew of BGCC. They are also a Fresh Moves mobile produce market site. And they are part of the Communities in Schools (CIS) program which helps schools partner with a large array of crucial community services. (CIS connects hospitals, universities, theaters, community-based nonprofits, government agencies, museums, corporations and individuals to schools that need the programs they offer.) The Whitney Young Dolphins Making a Difference have a mentoring program at West Pullman. The school is also a participant in Columbia College’s Science Institute. Find West Pullman on schoolcuts.org.